As health care education and research are constantly advancing and improving, French Hospital is taking steps to stay ahead of the curve with the new Copeland Health Education Pavilion. The Pavilion, opened in November 2015, provides the community with the most advanced health care research facilities and education resources, free of charge. The three-story, 18,000 square foot Pavilion includes two classrooms, a boardroom, and two full-size simulated hospital patient rooms for training medical professionals. The Pavilion also includes an auditorium with floor-to-ceiling windows that can accommodate up to 214 people and is available for local nonprofit organizations to use. As a hub for health care education, the Pavilion provides a variety of preventive health education classes to the community through a new Community Wellness Program, free of charge. The Pavilion also houses two advanced learning facilities: the Institute for Health Education and Research and the James R. Flanagan Simulation Learning Center. Are you a nonprofit interested in using a space in the Pavilion? Please call 805.542.6300 to check availability. The Institute for Health Education and Research is devoted to cutting edge scientific health care informatics and prevention research. Included within the Institute is a research lab and an “idea incubator lab” - an interactive conference room for developing research projects. The Institute collaborates with California Polytechnic State University San Luis Obispo (Cal Poly) to conduct research related to disease prevention and health promotion on a national level. The James Flanagan Simulation Learning Center is at the forefront of simulation learning technology. The Center includes two simulation suites set up as hospital patient rooms to ensure the most realistic and effective training possible. This Learning Center has four simulation manikins that mimic all patient types, including a male that simulates various medical conditions, a female obstetrics patient that simulates childbirth, a baby simulation manikin and a juvenile simulation manikin. The manikins provide medical staff and nursing professionals with realistic training to teach new procedures and ensure their skills are up-to-date. Help from two local couples has made this multimillion-dollar project possible for the community. Jim and Sandy Copeland and Tom and Pam Copeland have helped to make the Pavilion a reality, donating the entire building to FHMC. The Copelands are longtime San Luis Obispo residents, recognized business leaders, philanthropists, and avid supporters of FHMC. Previously, the Copeland family was instrumental in creating the Copeland, Forbes and Rossi Cardiac Care Center and was a major contributor to the “French – Well into the Future” Campaign. 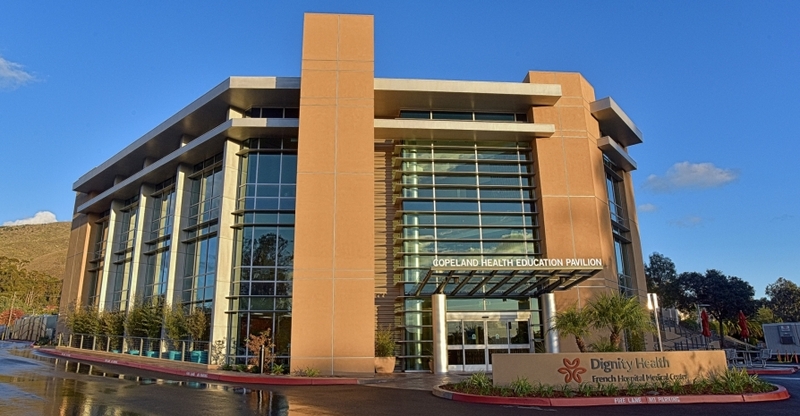 Jim Copeland, former FHMC Community Board Chairman, believes that community investment is important to secure a bright future for the hospital and therefore, sustained health care excellence for everyone on the Central Coast. Support is currently sought for the new technology and programs housed within the Pavilion.